Thank you for the opportunity to provide input regarding the structure and content of local participation in Maryland’s Phase III Watershed Implementation Plan (WIP). A subset of Choose Clean Water Coalition members and other concerned partners appreciate the ongoing in-person and in-depth discussions with Maryland Department of the Environment, led by Lee Currey and your other colleagues on this topic. This letter follows those discussions. The undersigned members of the Choose Clean Water Coalition are pleased to present these detailed recommendations in pursuit of a successful process for Phase III WIP local engagement. Fulfill EPA expectations to account for future growth and ensure robust BMP maintenance and verification. Phase II WIP process, the midpoint assessment presents a fresh opportunity to join local and regional efforts to reduce pollution and to develop a viable plan for doing so. In order for Maryland to achieve its 2025 goals, the state must establish a clear understanding of who is accountable for which targets and pounds of pollution reduction. We recommend an involved and collaborative approach with local governments, notably counties, to reach identified local targets and identified measures to hold every level of government accountable and provide reasonable assurance that targets will be achieved. The following provides specific points of analysis and recommendations. Maryland’s investment in the development of the Phase II WIP produced important results. WIP teams convened by state agency representatives and informed by key data enabled a diverse set of stakeholders to recommend WIP implementation measures that were relevant, applicable, and feasible at local and regional scales. County pollution reduction targets included during that process stimulated interest and creativity around proposed work and helped focus energy on discrete sets of programmatic and implementation actions. Although several recommended actions remain undelivered, they continue to have significant potential to underpin and motivate activity in the WIP’s third phase. There was also healthy diversity among participants, which should be maintained. Recognizing the vital importance of local government investment in water quality improvement, NGO partners recently sought to better understand the value and results of various local accountability measures included in Phase II. In 2017, the Choose Clean Water Coalition held two round table meetings to review the performance of Phase II elements including county targets, milestone expectations, and progress reporting. Local government and NGO representatives in attendance heard updates relayed from MDE staff and discussed what the Phase III process should look like. Meeting participants laid out different options and assessed their pros and cons in making recommendations. Through this process, we found that local governments were generally agreed that more direction from MDE would be helpful. While local governments are typically apprehensive to accept new regulatory proposals, many said that accountability played a key role in clarifying expectations, substantiating local investment, and generating interest from elected leaders. A number of local government representatives said that local targets are helpful and that continued support and direction from the state would be useful in Phase III. Provide county governments with a template to complete a program assessment that identifies what has worked, what has not, and what is most needed to increase capacity for pollution reduction between now and 2025. Based on this assessment, encourage county governments to update their local Phase II plans to provide a roadmap to reach 2025 goals. Based on the state’s gap analysis and the local program assessment, collaboratively develop numeric county planning targets and clear lines of accountability and transparency for achieving them. Align state water quality funding sources to more fully support achievement of local milestones. Create ombudsmen positions and increase staff resources available to local governments to plan, prioritize, design, and secure funding for local milestone projects. Refine optimization tools and develop a “lite” version of CAST to assist local scenario planning. Include in the Phase III WIP those regulatory, fiscal, or programmatic actions the state would need to take to make up for any implementation shortfalls associated with county planning targets. Ensure consistency between restoration requirements in MS4 permits and county and statewide nutrient load reduction requirements in the Phase III WIP. See the Choose Clean Water Coalition letter sent to MDE on August 25, 2017 for more details. Provide training to help counties participate in the state’s BMP verification protocols. Establish an independent verification team to review BMP reporting and recommend improvements to tracking and maintenance protocols. In consultation with local governments, the development industry, environmental groups, and other stakeholders, adopt a robust Accounting for Growth policy that minimizes new or expanded pollutant discharges to the maximum feasible extent and fully offsets the remainder to ensure that it does not result in an overall net increase in pollution. Consider offering data resources and collaborative stakeholder opportunities like those undertaken by Pennsylvania and Virginia. Target state resources to support partnerships and facilitate cross-sector discussion and implementation where appropriate. Form a Local Working Group to advise MDE on local engagement in the Phase III WIP, including the program assessment, local gap strategies, resource needs, and the development of county planning targets. Many of the undersigned organizations find that the Phase II WIPs provide valuable information about local conditions, local capacity to reduce pollution, and expected levels of BMP implementation over the Phase II planning period. Many local plans also identified specific opportunities to increase the rate of progress. Our experience working with local governments since that time has demonstrated that the local Phase II WIPs remain relevant and instructive. The central challenge in most jurisdictions at this time is not planning, but instead creating the conditions necessary to accomplish these plans. As such, we do not believe that the best value lies in asking local jurisdictions to “reinvent the wheel” by producing entirely new, separate Phase III WIP documents. Instead, we recommend that MDE request counties to undertake a program assessment that builds on their local Phase II WIPs as the first step in local Phase III WIP planning. This assessment should lead to the development of a strategy to close any projected capacity or implementation gaps identified for the 2018-2025 timeframe. Specifically, the program assessment should identify what worked and what was not accomplished during the Phase II implementation period. The assessment should flag areas where the plan is off track, and evaluate prospective changes that can be made to programs, regulations, and budgets to accelerate progress related to programmatic capacity and BMP implementation. To have reasonable assurance that sufficient progress occurs going forward, MDE should encourage that the capacity enhancing measures included in the assessment are designed to achieve anticipated pollution reductions and clearly identify the resources needed for the enhancements to occur. The template should solicit descriptive information in objective and measurable terms wherever possible. Much of this evaluation could be facilitated and enhanced by integrating or cross-referencing other local planning documents, watershed restoration action strategies, and county budgets. For example, indicators of a county government’s capacity to implement projects could include an account of dedicated funding and staffing, program administration commitments, or local rules and regulations. Capacity can also be defined in terms of the factors that produce measurable progress toward milestone commitments or explicit support from county elected leadership. The gap strategy is an opportunity to highlight locally-dominant nutrient or sediment sources, as well as practices or procedures that have high potential to reduce pollution. To enable sufficient progress to be made going forward, planned actions must be specific about resource needs, increased budgets, and the methods intended to meet those needs. A preferred structure for ongoing communication between sectors and stakeholders during WIP implementation. County gap strategies (February 2019): counties finalize gap strategies based on local planning targets for inclusion in the draft Phase III WIP. This step should include a specific opportunity for public input prior to submitting the final strategy. The Phase III WIP should include numeric county planning targets that clearly define the pollution reduction responsibility attributed to each sector, including agriculture. County targets should be developed through a collaborative process and be provided jointly to the county governing body and the local Soil Conservation District to leverage the strengths of these institutions and maximize effectiveness and collaboration. Through the program assessment phase, counties provide key background information and local context that supports the development of planning targets and establishes critical interest in actions that result in targets being achieved. We expect that county targets will not require that local jurisdictions close the entire remaining statewide gap on their own, but should, together with measures by the state and other permit holders and soil conservation districts, represent a fair-share effort towards achieving the total caps. This must be connected to, but go beyond, stormwater practices in MS4 counties. Focusing the Chesapeake Bay partnership’s effort at a small scale was identified as one of the biggest capacity needs during the Phase II WIP. EPA’s interim expectations for the development of Phase III clarify that the Phase III WIP should include measurable planning goals below the major-basin scale. Local area planning targets at the county scale are therefore critical to the success of Phase III and are necessary to demonstrate reasonable assurance that the Chesapeake Bay TMDL will be achieved. It is imperative that numeric pollution reduction goals match the scale of decision-making authority and existing structures for project delivery that reside with local governments. In Maryland, most stormwater facilities, septic systems, and small wastewater treatment plants are managed by county and municipal authorities. Implementation of agricultural BMPs is coordinated by local Soil Conservation Districts. While some cooperative regional structures exist, most are largely unequipped and in many cases lack experience to implement a comprehensive watershed restoration program. Many local government partners report that concern with local targets in the Phase II WIP was rooted in the inability of the Chesapeake Bay Model to provide reliable estimates and projections at a detailed geography at that time. The current model contains greatly improved land use information that has been reviewed and endorsed by the Bay Program partners. In addition, some counties felt that Maryland’s process for allocating loads advanced without proportionality between the responsibility to reduce loads and the available capacity and most cost-effective opportunities to do so. Since then, the Chesapeake Bay Program partnership has improved the capabilities of the Model and convened a Task Force that has recommended viable methods for arriving at local planning targets. In December of 2016, the Task Force informally called for local goals to be U.S. Environmental Protection Agency’s Interim Expectations for the Phase III Watershed Implementation Plans (Interim Version – January 19, 2017) established in partnership with local and regional partners, stakeholders, and federal and state facilities going forward, at a scale below the state-major river basin. For Phase III, we recommend that MDE provide counties with numeric local area planning targets that represent attainable but accelerated goals for enhancing program capacity and implementation. The goals should be defined in terms of actions that provide MDE reasonable assurance pollution load allocations will be met overall. A county goal can facilitate an increase in coordinated action across sectors and across county lines, and prompt a focused effort on priority action while ensuring that reported progress is accounted for and validated to reach the total 2025 goal. Under the current allocation framework, requiring local jurisdictions to close the entire remaining gap for non-point sources is expected to be very difficult. In general terms, Maryland’s Phase III WIP strategy should be the sum of reductions already achieved, reductions expected under current programs, and a combination of enhanced state and local strategies to close the remaining gap. This means that, rather than setting an expectation that the county planning target requires local jurisdictions to close the entire remaining gap for non-point sources, county targets should instead represent a well-defined expectation for a substantial increase in local capacity to deliver BMPs. In other words, for sectors that are off track at the midpoint assessment, we would expect the local target to reflect an increase in the pace of implementation that is greater than current level of effort but less than the total sector burden. This, in combination with state stormwater and septic strategies, plus other sector allocations, should result in a plan to close the remaining gap. Opportunities for collaboration with municipal governments, soil conservation districts and NGO partners. There are differences of opinion over exactly how sector boundaries should be defined and if and to what extent they should be used within the local planning target framework. Several rural jurisdiction representatives felt they had no control or exact data on the largest pollution sources in their county -- namely agriculture. We understand the potential for cost savings and faster implementation that comes with such flexibility; however, a single planning target that is everybody’s responsibility could quickly become nobody’s responsibility without shared accountability measures in place. If provided by sector, the magnitude of these targets could still be balanced among counties across the state to focus the majority of a specific county’s effort on the most pressing and potentially cost-effective solutions within that jurisdiction.3 Knowing and evaluating progress across sectors and better understanding who is responsible for each piece of a pollution reduction plan will be very useful. In no case should local targets reduce or rescind a load reduction required in an existing permit. Regardless, Maryland needs to ensure there are clear lines of accountability for who is ultimately responsible for pollution reduction. Feedback from local staff and elected officials at the roundtables last fall highlighted the value of local milestones in maintaining focus and effort towards pollution reduction goals. In short, county milestones for planning and implementation provide focus and coordination for restoration activity at the local level. We believe that MDE should continue this accountability structure in Phase III and better coordinate the deployment of financial resources and technical assistance with achievement of local milestones. Doing so would increase the incentives that encourage localities to actively participate in the Phase III WIP process. Maryland should invest more funds in county resources, particularly to encourage and reward attaining milestones. As a first step, we recommend that MDE and DNR increase the proportion of state funding that flows through the Local Milestone Implementation Grant program. We also recommend that these agencies adjust the scoring systems of the Bay Restoration Fund and the Trust Fund to support projects proposed by local jurisdictions that are actively pursuing local milestone commitments. Specifically, MDE should consider refining its Integrated Project Priority System in order to steer funding toward these jurisdictions and projects. Moving forward, the state should allocate more funding to MDE and relevant agencies to properly administer this enhanced milestone framework. For example, Maryland’s capital budget for water programs has been reduced to well below the historic average in recent years. It would be counterproductive to continue these deficient levels of capital support given the tremendous need for restoring our water infrastructure systems and accelerating progress to meet our 2025 TMDL targets. Instead, we recommend that MDE propose to increase capital spending for pollution reduction programs administered by the Water Quality Financing Administration. Additionally, we hope DNR and the Bay Cabinet will consider engaging in discussions on how to set aside or increase similar incentive funds from the Chesapeake and Atlantic Coastal Bays 2010 Trust Fund to reward strong local performance. MDE will have to balance the use of incentives with the need to place investments where they can be done in the most cost-effective way. Local jurisdictions will require additional resources in order to meet the goals as defined in this phase of the Bay TMDL. MDE can play a valuable role in supplying tools and technical assistance that better prepare localities to accomplish what the state asks of them. Another investment that MDE should consider is the placement of ombudsmen with local jurisdictions to assist those areas with planning and implementation of BMPs for the purpose of WIP implementation. Ombudsmen may assist with identifying, prioritizing, permitting, and securing funding for projects. This may also offer an alternate way to address when jurisdictions fail to reach acreage requirements in nonpoint source MS4 permits. With a full cycle of MS4 permits to evaluate, it has become clear that adequate investment in the supporting tasks of project identification, prioritization and permitting is a key driver of progress. For example, Anne Arundel invested in stream assessments for the 10 years prior to the latest MS4 permit and as such, has a backlog and priority of projects. It has streamlined its permitting process and while not perfect, it is moving forward and making progress. In contrast, in some other urban jurisdictions there is no backlog because the projects that have been identified have not been prioritized and the permit process is still overly cumbersome. On the Eastern Shore, MDE is partnering with an NGO and local jurisdictions to leverage funds from EPA that are enabling investment in a technical service provider that is shared by multiple localities. The pilot project will help unregulated and Phase II MS4 jurisdictions in this region maximize limited resources with a goal of planning, prioritizing, and streamlining delivery of projects for WIP credit. Models similar to this could be replicated in other rural regions of Maryland where under-resourced localities that are not subject to a stormwater permit face significant capacity constraints. The location of an ombudsman position like the one being piloted on the Shore could be determined in part by the degree to which presiding jurisdictions are investing in closing the gap to meet their 2025 goals. Maryland is fortunate to have several technical service delivery structures already in place that could be refined or enhanced to support a statewide local ombudsmen program. MDE could reinvest in staff resources directly to support this work. The Watershed Assistance Collaborative and the University of Maryland Sea Grant Extension supply restoration specialists to support local projects and priorities. MDA’s Soil Conservation Districts and Resource Conservation and Development offices both contain seasoned and skilled stormwater management practitioners. Regional Councils offer key services to multiple counties with similar needs. These entities, with modest additional investment or reprioritization, could be leveraged to increase staff capacity to support WIP obligations. Staffing vacancies at MDE should also be filled and assigned to support local jurisdictions with their water quality improvement efforts. Funding for technical assistance could come from a variety of sources. State agencies could apply as-yet unused legislative appropriations for staffing. The Trust Fund could provide measured outlays for technical assistance. An ombudsmen program may also be funded by leveraging resources from multiple partners who share in the cost of the program’s delivery. The Eastern Shore pilot offers an attractive model where partnering local jurisdictions, MDE, and EPA through the National Fish and Wildlife Foundation share in the cost of the ombudsman position that serves six localities. Other funding partners could include the Rural Maryland Prosperity Investment Fund, which has been receiving a growing allocation from the Maryland General Assembly and could be tapped to further diversify and minimize financial commitments from any single entity. The ombudsman and other forms of technical assistance should help not only accelerate progress towards nutrient reduction and optimization of cost effective measures, but also ensure projects and BMPs create multiple benefits through Green Infrastructure (GI) and other innovative strategies. State and local Phase III WIP planning should project how proposed project will reduce other pollutants of local and regional concern, and preference should be given to strategies that address multiple pollutants. In many cases, projects and activities can be chosen to reduce nitrogen, phosphorous and sediment while also removing other pollutants. For example, EPA studies on Green Infrastructure bioretention systems show that they can also effectively remove significant heavy metals.4 Green Infrastructure projects tend to remove or treat other pollutants and provide multiple benefits while helping to meet nitrogen, phosphorous and sediment goals. Riparian buffers, for example, can also provide several benefits. While the three main pollutants should remain the main focus of the Phase III WIPs, MDE should explore ways to encourage other non-nutrient TMDLs into the Phase III WIPs. We also approve of MDE’s incorporation of salt and deicing in the new MS4 draft templates. Our organizations believe that the Phase III WIP will best be positioned for success when state and local reduction commitments, policies, and investments are coordinated and working together. However, we are cognizant that a variety of factors could result in counties, soil conservation districts, and permitted entities falling behind local pollution reduction targets. In this regard, it is imperative that MDE outline in the Phase III WIP the specific actions that it will need to take to maintain a suitable 2025 trajectory if regulatory or programmatic changes are not made as expected in local permits and Phase III WIP gap strategies. This “second pathway” or “contingency plan” to achieving the 2025 goals could help Maryland’s Phase III WIP meet the reasonable assurance standard in the Clean Water Act and clarify expectations and alternatives for all stakeholders. This contingency plan should be included as a section in the Phase III WIP. For permitted entities, corrective actions should accelerate pollution reduction work that is in non-compliance or behind schedule to maintain the pollution reduction timetables outlined in the WIP. Corrective actions in noncompliant jurisdictions may include increasing pollution reduction activity or responsibility, hiring of additional staff or ombudsman to perform technical assistance and add capacity, or withholding of other funding. Any deadline extensions should not push back work anticipated by the WIP under a future permit; instead, these responsibilities must be cumulative and be satisfied concurrently. MDE should also promote public transparency in their compliance programs, in line with the practices of many neighboring states. For unregulated sectors and jurisdictions, MDE should outline those state policies that would be needed to fill any gaps in achievement of local targets. For example, the state may find it necessary to require Best Available Technology on new or replacement septic systems beyond the Critical Area in jurisdictions that are unable to make progress in that sector through other means. Or as a fiscal example, the state may need to reallocate local distributions of the Bay Restoration Fund to tackle the most significant local sources of pollution. For both regulated and non-regulated entities, MDE and MDA should consider use of a third party to assess the activity in a jurisdiction that is determined to be off track with pollution reduction targets. This third party could provide independent recommendations for increasing capacity or efficiency that could help improve the rate at which projects are implemented during the permit lifecycle or other relevant schedule. The third party could be sourced from EPA, the Chesapeake Bay Program, or an authorized technical service provider. Improvements in water quality are directly tied to the amount of pollution from upland sources that surface waters receive. In the wastewater sector, EPA and MDE regulate point source dischargers based on levels of nitrogen and phosphorus leaving the permitted facility. This regulatory structure has proven effective at ensuring damaging pollutants are adequately controlled. Permitted dischargers of stormwater should similarly be required to treat polluted runoff on a direct water quality basis rather than solely on a water quantity basis. The MS4 permit program must continue providing a strong regulatory framework for all jurisdictions to meet Clean Water Act requirements. Recent conversations with MDE have suggested that the agency may make multiple changes to the program that, in our view, would represent backsliding compared to current requirements, including expectations outlined in the Phase II WIP. Ongoing enforcement and technical assistance from MDE are both necessary to ensure MS4 jurisdictions continue working to address their stormwater challenges. Lack of funding, permitting timelines, budgetary cuts, or waiting for nutrient trading markets are not acceptable excuses for missing MS4 permit deadlines. Phase III WIP restoration methodology and metrics should directly connect MS4 permits to the amount of pollution a water body can safely assimilate based on the applicable TMDL. For the next generation of Phase I MS4 permits, Waste Load Allocation (WLA) reduction requirements should be combined with durable Green Infrastructure restoration requirements to meet the Chesapeake Bay TMDL, local TMDLs, and stormwater volumetric reductions. The inclusion of a requirement to meet WLAs with a minimum GI requirement will support both water quality improvements and runoff reduction for local waterways and the Chesapeake Bay. Establishing the WLA as the ultimate reduction target sets a clear and transparent standard for pollution reduction. By establishing GI targets in permits, regulated dischargers would be compelled to implement the most efficient and cost-effective pollution control technology available, providing confidence that projects on the ground will achieve water quality targets. Under this methodology, the GI requirement in a permit would not be a percentage of the county’s impervious surfaces (e.g. 20%) expressed in acreage but rather a percentage of the WLA (e.g. 40%) expressed in pollutant pounds that come from projects and practices with efficiencies approved for credit by the Chesapeake Bay Program. A GI standard tied to water quality in permits would enable MDE to demonstrate greater assurance to EPA that stormwater pollution reduction targets are being met. Moreover, while green infrastructure and many stormwater BMPs are often deemed as not “cost-effective” they are, in fact, economically efficient options given the plethora of health, environmental, climate, and economic benefits. MDE should help local governments use the Bay Program’s new “optimization engine” and tools as a way to prioritize such multi-benefit BMPs. Additional details on our recommendations for MS4 permits are included in the Choose Clean Water Coalition letter sent to MDE on August 25, 2017. The importance of strengthening verification protocols in Maryland at this point in time cannot be overstated. In order to meet Bay TMDL goals, MDE and local jurisdictions need to accelerate the pace of projects, as well as provide proper verification that leads to well-maintained BMPs throughout their life cycle. As stated by the Validation Panel of the Chesapeake Bay Program, assuring transparent and accurate BMP meets definition verification was, and remains, critical to achieving true long-term improvements in water quality and establishing public trust. Verification and validation are of utmost importance. Especially since non-validated BMPs and programs will no longer get any credit under the new Bay model, outreach to localities to ensure they have proper monitoring, evaluation, maintenance and compliance assurance procedures in place is paramount. Otherwise, localities may be surprised and discouraged by progress that is less than expected towards the 2025 cleanup goals. According to surveys of six counties in 2015, only 42% of BMPs were in good condition. Another 25% are failing in ways that negate most aquatic resource protection benefits and the remaining 33% are in need of maintenance.5 When BMPs are not maintained properly, they are not effectively performing the pollution reduction that was designed and counted. Maintaining existing BMPs is one of the most cost effective methods of maximizing the results of local efforts to reduce pollution. Supporting agencies in improving compliance is usually the quickest, least costly, way of dramatically improving water quality. Maryland would benefit from an independent verification team and more funding to execute the protocols. To improve practices, verification needs to be carried out in conjunction with on-the-ground assessment and technical assistance as much as possible, especially in non-regulated sectors such as agriculture, stormwater facilities in rural jurisdictions and forestry. MDE and other agencies in Maryland need greater capacity to ensure the verification plan is fully executed. We commend MDA for proposing to establish a BMP Verification task force, but we have not received further information on the establishment of the group or its work. If this proposal has been carried forth, the state should consider expanding the task force to supplement verification activities across BMP sectors, not just agriculture. Additional funds should be allocated to MDE, DNR and MDA in order to spearhead this verification task force. The Phase III WIP process must incorporate the means to account for any increases in pollution loads created by growth in the urban stormwater, wastewater, and agricultural sectors. For example, Maryland is losing nearly 2,000 acres of forest land per year to development. According to Chesapeake Bay Program loading rates, this conversion can result in a four-fold or more increase in pollution on a per-acre basis. MDE should make certain that counties have the information needed to plan in ways that do not jeopardize or counteract the pollution reduction progress they are making. The Phase III WIP must include a viable policy that quantifies the amount of new pollution created from growth and ensure that these loads are fully offset. Specifically, the policy must ensure that any activity within its jurisdiction that will produce a new or expanded discharge of nitrogen, phosphorus, or sediment will be reduced or met by offsets. The discharger of the increased pollutant must be required to mitigate the increase at the source or secure one or more legally enforceable offsets before that activity may commence. This is required under the Clean Water Act and EPA’s implementing regulations. There is no need to start from scratch in the Phase III WIP. But this does not mean MDE should refrain from actively engaging and supporting local government action between now and 2025. The momentum and water quality improvements accomplished through local participation in Phase II need continued structure, support, and accountability. We urge MDE and the full Bay Cabinet to move forward rather than step back from its leadership role in fostering a coordinated state and local response to the water quality challenges facing the Bay and local waters. MDE should prioritize stakeholder support in the process and give direction to all of the parties that will be executing WIP plans. There has been significant turnover of staff and leadership in some local jurisdictions. This often means that, even in jurisdictions with a strong Phase II WIP, local elected officials and staff would benefit from outside knowledge and expertise to properly structure and execute a gap strategy as part of the phase III WIP. Our experience is that many local governments welcome more guidance and education. Pennsylvania has had informational and financing workgroups meet on a biweekly basis since the fall. Pennsylvania also has created a toolbox that includes GIS modeling and monitoring data. Maryland might explore using these workgroups and tools as a model. Virginia is also engaging Planning Districts and Soil Conservation Districts in regional engagement and collaboration. The Phase III WIP is a prime opportunity to focus support on partnerships that can get more done faster and for less money. While capacity assessments and pollution reduction goals can prepare local government partners to increase the performance of actions taken in Phase III, non-government organization (NGO) and public and private technical service providers can provide additional capacity to close remaining pollution reduction gaps. The undersigned organizations and our partners work diligently with local governments to provide value in accelerating the progress of pollution reduction as well as educating elected officials, policymakers, and the public in localities. There is great interest in engaging nonprofit organizations to help educate the public and policymakers about the importance of pollution reduction policies. In addition, many Foundations are actively providing financial support for local government outreach, financing options, and other implementation tools. Because much of the low hanging fruit has been picked, nonprofits and businesses can be helpful in continuing to accelerate the progress of projects. However, to be more effective, we recommend that the state target more funding and resources to encourage these public-private partnerships. There are also several opportunities for collaboration between agriculture and urban/wastewater sectors. More exchange of information such as progress reports and collaboration between Soil Conservation Districts and local government could produce cost-effective opportunities for pollution reduction. This is especially the case in non-regulated or newly-regulated jurisdictions. A diversity of agencies and sectors can also bring different elements to the table that make partnerships powerful synergistic forces. For example, SCDs bring experience and expertise in the design and delivery of projects. Local governments have an administrative structure, public land, and a method for engaging private property owners in placing BMPs on their land. Discussions facilitated by the program assessment and ombudsman role outlined earlier in this letter could aid in facilitating these local partnerships. The final push to 2025 has begun and Maryland must apply every effort to accelerate progress toward that goal line. In order to reach it, MDE will have to do more to assist localities, magnify engagement, create incentives for exceptional performance, provide more resources, and maintain effective transparency and accountability—including enforcing corrective actions when needed. The recommendations above are intended to provide a framework for local engagement that can be leveraged to address other issues that EPA and Bay Program partners expect to tackle in the Phase III WIP. For example, we understand that MDE plans to take climate change into account as the letter sent last year from the Choose Clean Water Coalition recommends. We urge MDE to help engage localities to ensure they know how climate change will affect them and how it should be incorporated into their planning and Phase III WIPs. In closing, we view the challenges ahead as MDE’s best opportunity to reaffirm and invest in a holistic and comprehensive water quality restoration approach that ensures more nonpoint source pollution projects go into the ground faster and remain well maintained. Reaching the Chesapeake Bay TMDL 2025 goals will require a Phase III WIP process that allows all partners to share clear expectations and accountability for progress along with the tools and support needed to get the job done. If you have any questions, please contact Ben Alexandro, Maryland League of Conservation Voters, at balexandro@mdlcv.org and Erik Fisher, Chesapeake Bay Foundation, at EFisher@cbf.org. The undersigned members of the Choose Clean Water Coalition want to express their thoughts on two key issues that will be discussed at the Principals’ Staff Committee (PSC) meeting in March. First, is the decision regarding inclusion of the model results of climate change in the Phase III Watershed Implementation Plans (WIPs). Second, is the approach being used to help satisfy West Virginia and New York’s “special case” allocations. Members of the Coalition are deeply concerned and disappointed to learn that the PSC was unable to come to a consensus on whether to communicate the Bay modeling estimates of the effects of climate change in the Phase III WIPs. This decision is short-sighted. Inclusion of the model estimates would be an important public acknowledgement of the challenges ahead, could inform near-term strategies for qualitatively addressing climate change impacts in the Phase III WIPs, and would set the stage for future actions. In addition, in the absence of a definitive commitment to address pollution loads attributable to climate change, it is imperative that the Bay Program partners commit the resources necessary to refine the climate modeling and assessment framework that is needed to support final decision-making in 2022 on how to address climate-attributable pollution loads. In the near term, the Bay Program partners must also commit the resources necessary to investigate the climate resilience and climate co-benefits of restoration practices and to use this information when developing their Phase III WIPs. We also want to express our concern about the approach currently being considered to help close the gap for the “special case” allocations for New York (NY) and West Virginia (WV). Our issue is not with the additional allocations, per se, as we believe that NY and WV are justified in their request that the agreement reached in 2009, regarding additional allocations, be honored. Our concern stems from: (1) the reliance on additional NOx reductions that are expected to occur by 2030; and (2) the absence of any consideration that increases in ammonia emissions since 2009 should be offset. According to the February 12, 2018 presentation to the Water Quality Goal Implementation Team1 an additional 1.6 million pounds of nitrogen reductions, almost entirely from NOx reductions, is projected to be available by 2030. These modeled reductions are based on expected benefits from the implementation of state and federal Clean Air Act (CAA) regulatory programs. These expected reductions are far from certain. The Environmental Protection Agency (EPA) has recently proposed to repeal several national regulations, some of which are being relied upon for these reductions. According to the October 31, 2017 webinar hosted by the Chesapeake Bay Program,2 the future air modeling includes the benefits of the “CAFE Rule” and implementation of the 2015 ozone standard of 70 ppb, among others. Since there was no specific definition given for the “CAFE Rule”, we are interpreting it to apply to regulations that improve automobile fuel economy standards and reduce greenhouse gases. On August 17, 2017 EPA announced their Reconsideration of Final Determination on the Appropriateness of the Model Year 2022-2025 (and 2021) Light Duty Vehicle Greenhouse Gas Emissions Standards under the Midterm Evaluation.3 EPA is reconsidering whether the lightduty vehicle greenhouse gas (GHG) standards previously established for Model Year 20222025 are appropriate under Section 202 (a) of the Clean Air Act (CAA) and whether the lightduty GHG standards established for Model Year 2021 remain appropriate. In addition, on November 16, 2017, EPA proposed to repeal the emission requirements for glider vehicles, glider engines, and glider kits from GHG standards for heavy-duty trucks.4 Glider vehicles are new truck bodies that contain older engines. The proposed rule would remove the requirement for these engines to meet emission standards applicable in the year of assembly of the new glider vehicle. Failure to implement the Light Duty Vehicle GHG standards and to regulate the glider industry under EPA’s Phase 2 rule could result in the failure to achieve millions of pounds of NOx reductions nationwide and will affect modeled nitrogen reductions in the Chesapeake Watershed. These actions, taken together, indicate that the reliance on projected NOx reductions from state and federal CAA regulatory programs is, at best, now in question. It is worth noting that these actions will also result in more emissions of greenhouse gases that contribute to climate change, further exacerbating our Bay restoration challenges. One reason for the shortfall in expected nitrogen reductions from atmospheric deposition projected during the development of the Chesapeake Bay Total Maximum Daily Load is increases in ammonia emissions and deposition (see figure below taken from slide 39 in the October 31, 2017 air webinar). These increases are due, in part, to increases in ammonia emissions from agriculture (see slide 58). 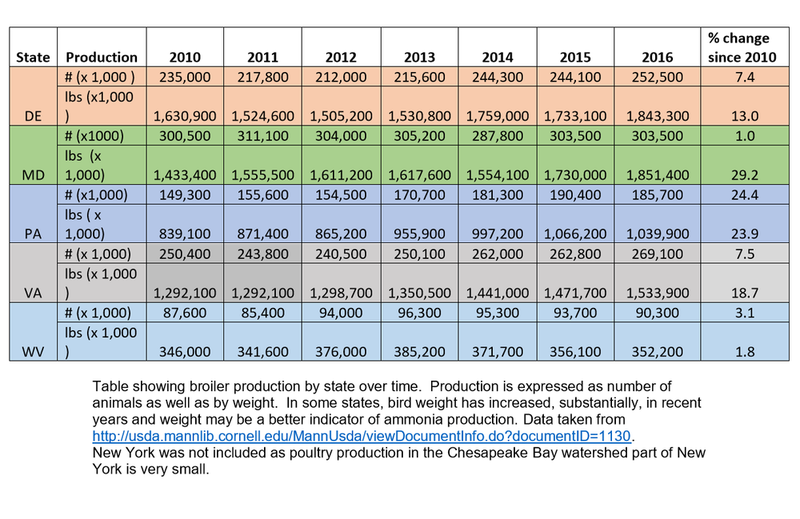 To that end, we note there have been substantial increases in poultry production in several states in the Chesapeake Watershed since 2010 (see table below) and poultry production is a known source of ammonia. Any additional nitrogen loads that resulted from these increases in poultry production should be offset by the states where the increases occurred, in accordance with Appendix S of the Bay TMDL and EPA expectations regarding state procedures to account for new and expanded sources of pollution loads. These additional reductions could be used to help close the gap on the special cases for NY and WV. Additional nitrogen loads associated with ammonia from animal operations that occur between 2009 and 2025 could be modeled using a similar approach as that used to estimate NOx benefits. The states responsible for these additional loads would receive a smaller allocation to offset these new loads. We sincerely thank you and the rest of the Principals’ Staff Committee for your leadership on Bay restoration and thoughtful consideration of our input. In addition, we welcome the opportunity to work with you and the other Chesapeake Bay Program partners in the coming months on the development of quality Phase III WIPs. Please contact Chante Coleman at 443927-8047 or colemanc@nwf.org with any questions or concerns. According to the February 12, 2018 presentation to the Water Quality Goal Implementation Team an additional 1.6 million pounds of nitrogen reductions, almost entirely from NOx reductions, is projected to be available by 2030. These modeled reductions are based on expected benefits from the implementation of state and federal Clean Air Act (CAA) regulatory programs. These expected reductions are far from certain. The Environmental Protection Agency (EPA) has recently proposed to repeal several national regulations, some of which are being relied upon for these reductions. According to the October 31, 2017 webinar hosted by the Chesapeake Bay Program, the future air modeling includes the benefits of the “CAFE Rule” and implementation of the 2015 ozone standard of 70 ppb, among others. Since there was no specific definition given for the “CAFE Rule”, we are interpreting it to apply to regulations that improve automobile fuel economy standards and reduce greenhouse gases. On August 17, 2017 EPA announced their Reconsideration of Final Determination on the Appropriateness of the Model Year 2022-2025 (and 2021) Light Duty Vehicle Greenhouse Gas Emissions Standards under the Midterm Evaluation. EPA is reconsidering whether the light-duty vehicle greenhouse gas (GHG) standards previously established for Model Year 2022-2025 are appropriate under Section 202 (a) of the Clean Air Act (CAA) and whether the light-duty GHG standards established for Model Year 2021 remain appropriate. In addition, on November 16, 2017, EPA proposed to repeal the emission requirements for glider vehicles, glider engines, and glider kits from GHG standards for heavy-duty trucks. Glider vehicles are new truck bodies that contain older engines. The proposed rule would remove the requirement for these engines to meet emission standards applicable in the year of assembly of the new glider vehicle. The EPA has also indicated interest in revisions to the New Source Review rule for power plants. This rule has been a major driver in the significant NOx reductions in the past ten years and changes to the rule could mean expected reductions will not occur. Finally, the implementation of the 2015 ozone standard is also in jeopardy, as EPA missed deadlines for promulgating the initial area of designations related to NAAQS for ozone and final agency action by EPA remains unclear. We sincerely thank you and the rest of the Principals’ Staff Committee for your leadership on Bay restoration and thoughtful consideration of our input. In addition, we welcome the opportunity to work with you and the other Chesapeake Bay Program partners in the coming months on the development of quality Phase III WIPs. Please contact Chante Coleman at 443-927-8047 or colemanc@nwf.org with any questions or concerns. Please accept the following comments from the undersigned members of the Choose Clean Water Coalition on Exelon Generation Company’s (hereafter, Exelon) application for Clean Water Act (CWA) Section 401(a)(1) Water Quality Certification. Exelon is requesting this certification as a necessary precondition of its related application to the Federal Energy Regulatory Commission (FERC) for a new 50-year license for the continued operation of the Conowingo Dam Project. Collectively, our groups represent hundreds of thousands throughout the Chesapeake Bay watershed interested and directly affected by the Maryland Department of the Environment's (MDE) decision to grant water quality certification to Exelon. On behalf of the undersigned members, we urge you to ensure that Exelon plays a large role in mitigating the significant pollution to the Chesapeake Bay that comes from the Susquehanna River and the Conowingo Dam. We recognize that the Conowingo Dam has played a crucial role in curtailing the sediment pollution that travels down the Susquehanna River and eventually reaches the Bay. However, over time, the Dam’s ability to trap pollution has diminished due to sediment build up behind the Dam. As studies have demonstrated that the Dam itself has the ability to negatively impact water quality, Maryland must ensure that impacts of Conowingo Dam’s operations on downstream water quality are addressed and mitigated as part of the new operating permit. Furthermore, Maryland cannot count on FERC to impose conditions needed to prevent or offset Project-induced scouring of sediment and associated nutrients concentrated behind the Dam. Unless Maryland imposes such conditions, its water quality goals and pollution control measures would be undermined by catastrophic sediment and nutrient discharges during one or more predicted high-flow events during the requested license period. Exelon has failed to provide sufficient information about the current and future effects of the Conowingo facility’s ongoing operation on water quality, and has failed to propose measures to offset those effects. Exelon has also failed to account for the additive effects of climate change upon sediment scouring, and Maryland must consider these impacts in its certification analysis. We therefore urge Maryland to impose conditions requiring Exelon to participate as a financial partner in a specific plan for large scale pollution reduction projects, on-the-ground restoration projects, best management practices – such as, funding the planting and maintenance of forests and riparian buffers - and other projects to reduce upstream pollution and mitigate downstream impacts in order to maximize the likelihood that applicable water quality standards and other CWA requirements will eventually be met. In addition, as explained below, the permit must include provisions for periodic review to evaluate the progress of these measures, their effects, and the availability of new monitoring data and pollution control technologies. If MDE chooses not to impose strong conditions on this certification, Maryland should deny the application outright due to its deficiencies. Section 401 of the CWA gives states the authority to review any federally-permitted or licensed activity that may result in a discharge to navigable waters, and to condition the permit or license upon a certification that any discharge will comply with key provisions of the CWA and appropriate state laws. These provisions include Sections 301, 302, 303, 306 and 307. This expansive certification authority preserves a substantial role for the states in protecting water quality, even when permitting authority lies solely in federal hands. When Section 401 applies to a project due to a potential discharge, the certification process applies to the “activity as a whole,” relating in any way to the existing or proposed discharge. In the case of a hydroelectric Dam project, for example, a certifying state must apply the certification process to a wide range of actions such as the trapping of nutrients and sediment behind the Dam, changes to stream flow and water temperature, increases in total dissolved gas levels below the Dam, and the release of sediments and nutrients below the Dam during both routine operation and increasingly common storm events. Section 401(d) of the CWA directs states to include in their certifications any effluent limitations, monitoring requirements, and other limitations and conditions in order to ensure that any discharge will comply with all applicable federal and state water quality laws. Of particular relevance to the license application for the Conowingo Dam are Sections 302 (federal water quality related effluent limitations) and 303 (state water quality standards, implementation plans and total maximum daily loads (TMDLs)), and corresponding provisions of Maryland law. If a proposed license or project will not comply with the applicable laws, a state must either deny a Section 401 certification, or conditionally grant certification with “any effluent limitations and other limitations, and monitoring requirements necessary to assure” compliance with the law. If a state denies certification, the federal permit or license for the project may not be issued. In this way, Section 401 grants states the authority to halt projects that illegally harm water quality. Alternatively, in cases where specific permit conditions would ensure compliance with the law, a state may conditionally grant certification and these conditions would become binding limitations on the permit or license. States have extensive authority to deny or impose conditions during the Section 401 certification process. As EPA has explained in recent guidance, “[c]onsiderations can be quite broad so long as they relate to water quality,” and “[c]ertification may address concerns related to the integrity of the aquatic resource and need not be specifically tied to a discharge.” In addition to ensuring compliance with the statutorily enumerated provisions of the CWA (Sections 301, 302, 303, 306 and 307), certifying states must assure compliance with “any other appropriate requirement of State law.” Courts have consistently interpreted this provision to mean that all state water quality standards must be satisfied. State water quality standards include designated uses for water bodies, as well as the quantitative (numeric) and qualitative (narrative) criteria needed to achieve the designated uses, and anti-degradation. Therefore, certifying states have the obligation to ensure compliance with both numeric and narrative water quality standards and the TMDLs used to achieve compliance with them, and use designations established to protect recreational uses and aquatic life. Indeed, courts have repeatedly allowed certifying states to deny certifications based on the need to comply with state water quality standards, including non-quantitative standards such as the protection of aquatic life and shellfish habitat. In the case of Exelon’s application for certification, the legal mandate to expansively enforce all state water quality standards prevents Exelon from simply relying on the Chesapeake Bay TMDL to absolve itself of any obligation to address the sediment pollution from the Dam. The Chesapeake Bay TMDL does not include a wasteload or load allocation to accommodate discharges of sediment or nutrients scoured from behind the Dam, and does not purport to relieve Exelon of its responsibility for such discharges. MDE must instead look beyond the TMDL and independently ensure that the project’s sediment discharges do not interfere with attainment of the Chesapeake Bay TMDL, or with the designated uses which ensure support of estuarine and marine aquatic life and shellfish harvesting. MDE must also ensure compliance with Maryland’s narrative water quality standards, which prohibit pollution by any material in an amount that would “[c]hange the existing color to produce objectionable color for aesthetic purposes” or “[i]nterfere directly or indirectly with designated uses,” among other things. In other words, MDE may not grant Section 401 certification unless it imposes conditions which prevent the violation of all numeric and narrative water quality standards, and all designated uses. 2. MDE Should Either Deny Certification or Establish Conditions on its Certification Sufficient to Offset Project-Induced Effects on Nutrient and Sediment Discharges. Because the enormous quantity of sediment accumulated behind the Conowingo Dam is subject to massive overflow in the event of major storm events, causing catastrophic damage, there is no way that MDE can issue a certification that operation of the Dam and resulting discharges during the life of the requested operating license will at all times comply with applicable water quality standards, TMDLs and other requirements. Therefore any Section 401 certification for the Conowingo Dam Project should include conditions requiring Exelon to play a role in the cleanup efforts for the Conowingo Reservoir. While it is true that the origin of the sediment and nutrients from behind the Dam is mostly from upstream of Conowingo, the Dam does alter the form of these sediments and nutrients and the timing by which they enter the Chesapeake Bay. For example, the Dam changes the grain size profile of downstream sediments, preferentially passing finer sediments that tend to stay in suspension longer, with potential negative effects on downstream water clarity and underwater grasses. Coarser materials are preferentially retained by the Dam, again with negative downstream impacts as these materials are needed to build and protect desirable habitats, like islands and shorelines, for fish spawning and rearing, mussels and Submerged Aquatic Vegetation. These are all incremental impacts directly, indirectly, or cumulatively caused by Conowingo Dam’s impoundment and artificial release of the Susquehanna River. In addition to these impacts, scouring events caused by high flows mean more nutrients and sediments will flow downstream than are attributed to upstream sources. The Dam has historically trapped an average of 50-67% of the annual sediment load (1.5 to 2 million tons), along with the nitrogen and phosphorus attached to the trapped sediment. If not for the Conowingo Dam, this load would have been delivered to the lower Susquehanna River and Chesapeake Bay at normal rates. The Dam and its reservoir have produced an enormous artificial repository of sediment and associated nutrients that can be scoured by high flow events, re-mobilized, and delivered downstream by large storm-induced flows. These scoured loads produce additional pollutant loads at times when the downstream receiving waters are already vulnerable, receiving their heaviest loads of suspended pollution from the Susquehanna River watershed. A recent study from the University of Maryland Center for Environmental Science (UMCES) shows increased mobilization of harmful nutrients during these scour events. As explained in the study, much of the phosphorus released during scour is, initially, in a form that is not bioavailable (due to binding with iron). However, some particles do settle in the mid-Bay and others are eventually transported there. Under conditions in the mid-Bay, particularly anoxia, this phosphorus can become available for uptake by phytoplankton and, therefore, can contribute to eutrophic conditions, including depressed dissolved oxygen. There is a substantial amount of adsorbed ammonium in the sediments behind the Dam, at concentrations exceeding those in similar sediments downstream. This ammonia will be mobilized during scour events adding nitrogen loads to downstream waters. The threshold flow needed to produce scouring will be surpassed many times during the requested license period. Scoured loads deliver much greater quantities of sediment and nutrients to the Chesapeake Bay than the natural loading that would have occurred during the same flow events had the Project not been in place. Particularly in the case of very large storms – such as 25-year, 50-year, 75-year, and 100-year return interval flow events, for which there is a substantial to reasonable likelihood of occurrence during the requested license period, as discussed below – project- induced scouring could overwhelm pollution reductions undertaken upstream in the lower Susquehanna River watershed. The effects of climate change will also likely lead to more frequent and severe scouring events at the Project. Over the past century or so, the Northeast (including the Chesapeake Bay region) has experienced increases in the average annual temperature, amount of precipitation, and amount of extreme precipitation events, and these trends are expected to continue and strengthen in the coming years due to climate change. These significant climate-related impacts must be considered by MDE during the certification process because they will likely increase the predicted levels of scouring threshold exceedances that were originally assumed for the Project. MDE cannot rely on the Chesapeake Bay TMDL to account for the effects of climate change, and must independently analyze the best available climate projections for the region in order to account for these additive impacts. Fundamentally, MDE has a legal obligation to consider more than mere TMDL compliance (or noncompliance) because MDE must also analyze whether the Project as a whole will interfere with the river’s designated uses and narrative water quality standards under the expected climate conditions in the coming decades. The Chesapeake Bay TMDL does not analyze the effects of the Conowingo Dam on Maryland’s state water quality standards under any conditions, much less under the projected future climate in the Northeast, and this climate analysis is an essential component of the state certification process. Furthermore, any increases in nutrient and sediment pollution from the Dam due to climate change were simply not considered in the Chesapeake Bay TMDL. The TMDL’s assumptions about pollution levels did not account for the additive effects of climate change. In fact, only a very vague and preliminary assessment of climate change was completed for the Chesapeake Bay TMDL as a whole in 2010, due to limitations in the modeling that was available at the time. Although the TMDL’s Midpoint Assessment is incorporating more up-to-date information about the impacts of climate change, it remains unclear precisely how climate change impacts will change the TMDL load allocations, if at all. Moreover, there are no indications the Midpoint Assessment will consider the impacts of climate change on the Conowingo Dam’s specific effects. MDE must complete its own, independent analysis of the effects climate change will likely have on the Conowingo Dam Project’s impacts to Maryland’s water quality standards. This is consistent with the “Goals and Outcomes” in the Chesapeake Watershed Agreement of 2014, p. 14, which call on the Bay Partners to address the need for “climate resiliency.” In the Agreement the Bay Partners committed to, among other things, “pursue, design and construct restoration and protection projects to enhance the resiliency of Bay and aquatic ecosystems from the impacts of coastal erosion, coastal flooding, more intense and frequent storms and sea level rise.” These objectives must be considered by MDE and Exelon in the context of any license renewal for the Conowingo Dam. Finally, the Lower Susquehanna River Watershed Assessment (LSRWA) had some key findings in terms of the Dam’s effects on dissolved oxygen, water clarity, and chlorophyll a concentrations (See Attachment 1) - as outlined in the attached Comment from the Chesapeake Bay Foundation (See Attachment 2). We also attached a letter from Waterkeepers Chesapeake and an independent third-party review that further discusses this issue in detail (See Attachment 3). Under the CWA, Maryland is responsible for setting forth any effluent limitations or any other conditions or limitations and monitoring requirements that may be necessary to assure compliance with the Act, including applicable water quality standards and the Chesapeake Bay TMDL. In order to preserve the state’s water quality standards, the state must address two separate problems - the sediment that is trapped in the Dam’s reservoir and the sediment now flowing through the Dam due to its inability to trap any more sediment. Any Section 401 certification issued to support a renewed FERC license for the Conowingo Dam Project must include: (1) a number of conditions requiring Exelon to contribute financially to a specific mitigation and cleanup plan; (2) a detailed analysis of the effects of climate change; (3) a detailed analysis of the Conowingo Dam dredging pilot project that considers the potential water quality effects of adsorbed ammonia in Conowingo Reservoir that would be released during dredging; and (4) adaptive management to take into account changing conditions and pollution reduction technologies that will occur during the life of the license, as discussed below. The mitigation and cleanup plan should include large scale pollution reduction projects, on-the-ground restoration projects, best management practices, and other projects to reduce upstream pollution and mitigate downstream impacts. For instance, measures could include financial assistance for nutrient reduction projects upstream of the Dam, in Maryland, Pennsylvania, and New York such as agricultural conservation practices, wastewater treatment plant upgrades, green infrastructure, and restoration of the system’s “natural filters” (i.e., propagation of freshwater mussels and oyster restoration downstream). The goal is to have mitigation efforts in place to ensure pollution reductions equivalent to the maximum amounts of nutrients estimated to be associated with sediments scoured from behind the Dam and any additional pollution produced as a result of the Dam’s presence and operation. We recommend that MDE require a number of cleanup actions as a condition on the license because one type of cleanup effort alone will not be enough. In assessing whether to dredge behind Conowingo Dam as one cleanup option, MDE must consider the potential water quality effects of adsorbed ammonia in the reservoir that would be released during dredging. We recommend that additional modeling scenarios be run with the new information from the Conowingo Dam dredging program, along with a review of other recent studies, about the fate, transport, form, and concentrations of nutrients and sediments from the Conowingo Reservoir, to assess the impact on water quality standards attainment. The State must act fast - if Maryland does not deal with the trapped sediment behind the Dam, all of our efforts to clean up the bay and meet the state’s 2025 TMDL goals could be devastated by one major storm. Maryland cannot wait to start these cleanup efforts – Maryland must partner with Exelon and other stakeholders and start the process now. Exelon must contribute financially to a specific plan for removing sediment and must act as a partner in implementing other remedial measures. Finally, the certification must require that the measures to reduce or eliminate pollution, including sediment overflow that are incorporated into the license reflect the need for adaptive management. Experience in working to restore the Bay and its watershed over the past several decades has taught us that as we proceed, new information becomes available, new pollution control measures will become available, and measures that today seem prohibitively expensive may become cost-effective in the future. For example, if beneficial reuse of dredged material from behind the Dam becomes a possibility, then enormous opportunities to reduce and prevent pollution will become available. Other new technologies not yet known will certainly emerge, and as performance monitoring data becomes available we will become smarter about which measures are most cost-effective. This is why in the Principles laid out on the first page of the Chesapeake Watershed Agreement of 2014 the Partners committed to “[a]daptively manage at all levels of the Partnership to foster continuous improvement” (emphasis in original). In the context of the 50-year lifetime of the anticipated license renewal for the Conowingo Dam, we recommend that the certification require as a condition of the license that the pollution control strategy be revisited at least every five years at which point the licensee, MDE and other interested parties will conduct a comprehensive assessment of the performance of the pollution control measures then in place, and opportunities to employ new technologies and measures, and accomplish the goals of pollution reduction and prevention as cost-effectively as possible so as to get the greatest environmental protection for the funds expended. Because of the importance of the Dam to the entire community, there should be an opportunity for public participation and opportunity for comment. Universities and other sources of expertise should be included in the review process. If MDE chooses not to impose strong conditions on this certification, Maryland should deny the application outright due to its deficiencies. We thank you for the opportunity to comment on this important state action. Final Multi-Project Environmental Impact Statement for Hydropower Licenses, Susquehanna River Hydroelectric Projects (March 2015) at 139. See USGS, et al., Lower Susquehanna River Watershed Assessment, Maryland and Pennsylvania at 65, Table 4-3 (May 2015) (hereafter “LSRWA”), http://dnr.maryland.gov/waters/bay/Documents/LSRWA/Reports/LSRWAFinalMain20160307.pdf (setting forth the annual exceedance probability for various return interval flow events, with expected flow estimates for the flow gauge at Conowingo Dam). This plan needs to account for the removal of at least 4 million tons of sediment from the Conowingo reservoir annually until 100 million tons are removed. The same level of sediment must be maintained thereafter. 33 U.S.C. §§ 1311, 1312, 1313, 1316 and 1317. For convenience the Section numbers of the Act, rather than U.S. Code citations, are used. PUD No. 1 of Jefferson County v. Washington Dept. of Ecology, 511 U.S. 700, 712 (1994). Due to climate change, it is predicted that all parts of the U.S. will see increases in storm intensities, and the Northeast will also experience a 58% increase in the average number of days with very heavy precipitation. Garfin et al., Assessment of Climate Change in the Southwest United States: A Report Prepared for the National Climate Assessment (2013), at 6, 8, http://www.swcarr.arizona.edu/sites/all/themes/files/SW-NCA-color-FINALweb.pdf; Hall and Stuntz, Climate Change and Great Lakes Water Resources (Nov. 2007) at 6-7, http://online.nwf.org/site/DocServer/Climate_Change_and_Great_Lakes_Water_Resources_Rep ort_FI.pdf. 33 U.S.C. § 1341(a)(1), (d). 33 U.S.C. § 1341(a)(1) (stating that certification is required when an activity “may” result in a discharge); see also U.S. EPA, Clean Water Act Section 401 Water Quality Certification: A Water Quality Protection Tool for States and Tribes (2010) at 4, https://www.epa.gov/sites/production/files/2016-11/documents/cwa_401_handbook_2010.pdf (“EPA § 401 Guidance”). See, e.g., PUD No. 1 of Jefferson Co., 511 U.S. 700 (holding that state water quality standards, including minimum stream flow requirements, should be enforced through § 401 certifications). Anacostia Riverkeeper Inc. v. Jackson, 798 F. Supp. 2d 210, 238 (D.D.C. 2011) (holding that a state’s total maximum daily loads for a water body must ensure protection of all state water quality standards, including all designated uses and water quality criteria, in order to satisfy the CWA). See, e.g., AES Sparrows Point LNG v. Wilson, 589 F.3d 721, 733 (4th Cir. 2009); Islander East Pipeline Co., LLC v. McCarthy, 525 F.3d 141 (2d Cir. 2008). See COMAR 26.08.02.08(B) (designating the Susquehanna as Class I-P and Class II in various segments); COMAR 26.08.02.02 (designating Class II waters as “Support of Estuarine and Marine Aquatic Life and Shellfish Harvesting”). Lawrence P. Sanford, Stephanie Barletta, UNCES Horn Point Laboratory, Cambridge, MD, Grace Massey, Kelsey Fall, Virginia Institute of Marine Science, Gloucester Point, VA. The Impacts of Conowingo Particulates on the Chesapeake Bay: Suspended Particle Size, Settling and Transport. UMCES Contribution TS-705-17. Final Report to Exelon Generation and Gomez and Sullivan, July 2017; see also Cornwell, J., M. Owens, H. Perez, and Z. Vulgaropulos. 2017. The Impact of Conowingo Particulates on the Chesapeake Bay: Assessing the Biogeochemistry of Nitrogen and Phosphorus in Reservoirs and the Chesapeake Bay. UMCES Contribution TS-703-17. Final Report to Exelon Generation and Gomez and Sullivan. July 28, 2017. See Final Study Report: Sediment Introduction and Transport Study: RSP 3.15 (Aug. 2012) at 11, 14-15 (“FSR 3.15”), http://mde.maryland.gov/programs/Water/WetlandsandWaterways/Documents/ExelonMD/FERC /Conowingo-FRSP-3.15.pdf; id. at 58 tbl.3.2-1 (citing Michael J. Langland, Bathymetry and Sediment-Storage Capacity Change in Three Reservoirs on the Lower Susquehanna River, 1996- 2008 (2009) (hereafter “Langland (2009)”): sediment accumulation rate for 1996-2008 was 1.5 million tons/year; for 1959-2008 average rate was 2 million tons/year); see also FSR 3.15 app. F at 5 (Exelon’s bathymetric survey of Conowingo Pond, estimating 1.45-1.69 tons deposited annually based on 2008-2011 average). See FSR 3.15 at i, 10-11; Michael J. Langland & Robert A. Hainly, Changes in Bottom- Surface Elevations in Three Reservoirs on the Lower Susquehanna River, Pennsylvania and Maryland, Following the January 1996 Flood—Implications for Nutrient and Sediment Loads to Chesapeake Bay (1997) (hereafter, “Langland & Hainly (1997)”); Langland (2009); Robert M. Hirsch, Flux of Nitrogen, Phosphorus, and Suspended Sediment from the Susquehanna River Basin to the Chesapeake Bay during Tropical Storm Lee, September 2011, as an Indicator of the Effects on Reservoir Sedimentation on Water Quality (2012) (hereafter “Hirsch (2012)”). LSRWA at 78 (noting that proportion of scoured sediment loads increases with higher flows); id. Table 4-7 (Scour and Load Predictions for Various Flows in Conowingo Reservoir). Cornwell, J., M. Owens, H. Perez, and Z. Vulgaropulos. 2017. The Impact of Conowingo Particulates on the Chesapeake Bay: Assessing the Biogeochemistry of Nitrogen and Phosphorus in Reservoirs and the Chesapeake Bay. UMCES Contribution TS-703-17. Final Report to Exelon Generation and Gomez and Sullivan. July 28, 2017. LSRWA at 65, Table 4-3. Kunkel, K. E., L. E. Stevens, S. E. Stevens, L. Sun, E. Janssen, D. Wuebbles, and J. G. Dobson, 2013: Regional Climate Trends and Scenarios for the U.S. National Climate Assessment: Part 9. Climate of the Contiguous United States, NOAA Technical Report NESDIS 142-9, available at https://scenarios.globalchange.gov/sites/default/files/NOAA_NESDIS_Tech_Report_142-1- Climate_of_the_Northeast_U.S_1.pdf (“Kunkel et al.”); see also Raymond Najjar, Climate Change in the Northeast U.S.: Past, Present, and Future, The Pennsylvania State University, Chesapeake Climate Projections Workshop, March 7-8, 2016, available at http://www.chesapeake.org/stac/presentations/258_Najjar%20Climate%20Chesapeake.pdf (“Najjar”). See, e.g., 33 U.S.C. § 1341(d); PUD No. 1 of Jefferson Co. v. Wa. Dep’t of Ecology, 511 U.S. 700 (1994) (holding that state water quality standards, including minimum stream flow requirements, should be enforced through § 401 certifications); Anacostia Riverkeeper Inc. v. Jackson, 798 F.Supp.2d 210, 238 (D.D.C. 2011) (holding that a state’s total maximum daily loads for a water body must ensure protection of all state water quality standards, including all designated uses and water quality criteria, in order to satisfy the CWA); AES Sparrows Point LNG v. Wilson, 589 F.3d 721, 733 (4th Cir. 2009); Islander East Pipeline Co., LLC v. McCarthy, 525 F.3d 141 (2d Cir. 2008); see also supra part I.C of these comments. EPA, Chesapeake Bay TMDL, App. E, https://www.epa.gov/sites/production/files/2015- 02/documents/appendix_e_climate_change_final.pdf. EPA, Chesapeake Bay TMDL 2017 Mid-Point Assessment: Guiding Principles and Options for Addressing Climate Change Considerations in the Jurisdictions’ Phase III Watershed Implementation Plans (Dec. 13, 2016), http://www.chesapeakebay.net/channel_files/24456/ii.f._climate_options_for_phase_iii_wips_cr wg_briefing_document_12.13.16.pdf. See, e.g., Chesapeake Bay TMDL 2017 Midpoint Assessment Policy Options and Implementation Considerations for Addressing Climate Change in Jurisdictions’ Phase III Watershed Implementation Plans (Sept. 6, 2017) (noting that the relevant committee has not yet decided whether to change the TMDL’s quantitative load allocations to account for the impacts of climate change), available at https://www.chesapeakebay.net/channel_files/25446/mpa_climate_change_policy_option_briefi ng_memo_wqgit_090617.pdf. See attached comment from Waterkeepers Chesapeake on the application’s deficiencies. The undersigned members of the Choose Clean Water Coalition want to express their strong support for adoption of both the numeric and programmatic proposals for addressing climate impacts during the development and implementation of Phase III Watershed Implementation Plans (WIPs). Over the last year, these proposals have been developed by the Chesapeake Bay Program (CBP)’s Climate Resiliency Workgroup, in collaboration with the CBP Modeling Workgroup, and have been extensively reviewed by the Scientific and Technical Advisory Committee. The proposals represent a reasoned and pragmatic approach to addressing climate change effects on Bay restoration and, in the case of the numeric proposal, is supported by rigorous scientific analyses. Adoption of the numeric proposal - the explicit quantification of climate change effects on the attainment of water quality standards - is necessary, because the Bay jurisdictions are bound by their commitment in the Chesapeake Bay Watershed Agreement of 2014 to address the impacts of climate change. This should be done consistent with legal precedent, and the Partnership’s strong history of using best available science in its management decision-making. Section 10.5 of the Chesapeake Bay TMDL (“Factoring in Effects from Continued Climate Change”) calls for action to “incorporate new scientific understanding of the effects of climate change into the Bay TMDL [...] during the mid-course assessment.” Federal courts have approved settlement agreements that require consideration of climate impacts arising from legal challenges to nutrient TMDLs, and, nationwide, newer TMDLs are accounting for climate change as an important factor in calculating watershed pollutant rates and the assimilative capacity of receiving waterways. The Chesapeake Bay Program partnership has a long history of commitment to sound science. In developing the Bay TMDL and in the ensuing implementation, the Partnership has relied upon rigorous scientific research, expert panels, and updated modeling tools to support planning and management decision-making. Confidence in this decision-making is fundamentally connected to the thorough quality assurance and peer review that undergird the Chesapeake Bay Program’s scientific processes. To reject policy proposals that account for climate change impacts on Bay restoration efforts would constitute a repudiation of the commitment to decision-making based upon the best available science. Furthermore, the Bay TMDL and Chesapeake Bay Program are viewed nationally, and even internationally, as potential models for ecosystem restoration. The integrity and credibility of the Partnership as leaders in ecosystem restoration could be compromised if climate change impacts are not considered both numerically and programmatically in the Mid-Point Assessment. The numeric and programmatic policy approaches will set a precedent for development of adaptive management strategies at a crucial period in the restoration process. Adopting these approaches today will help to ensure that resulting adaptive management strategies are more sophisticated and tested before the even worse effects of a changing climate take place after the TMDL’s 2025 deadline. The policy approaches will also help mitigate impacts of more severe storms and increased pollution loads and water temperatures on local rivers and streams in the near-term, thereby protecting water quality not just in the Bay, but throughout the watershed. Finally, the programmatic approach commits the Chesapeake Bay Program to establish a framework that will drive guidance and provide an incentive for study and design of climate-resilient BMPs. This in turn will encourage implementation of climate-responsive BMPs that will be relied upon for their restoration value years beyond the 2025 deadline. Adoption of the proposed policies will also ensure demand for continued agency-led study and monitoring of climate impacts to the Bay and its restoration. We thank you and the rest of the Principals’ Staff Committee for your leadership on Bay restoration and for your thoughtful consideration of our input. Thank you for the opportunity to comment on the draft regulations which were distributed on June 7. The undersigned organizations, including some of the over 200 member organizations of the Choose Clean Water Coalition, respectfully submit the following comments in response to the Maryland Department of the Environment’s (MDE) proposed regulations to establish a Nutrient and Sediment Trading and Offset Program. Choose Clean Water works in the seven jurisdictions, Delaware, the District of Columbia, Maryland, New York, Pennsylvania, Virginia, and West Virginia that make up the Chesapeake Bay region. The coalition’s members range in size and scope from national to regional to the most local level, but share the vision of vibrant clean rivers and streams in all of the Chesapeake region’s communities. One of the main objectives of the coalition is ensuring the Chesapeake Bay pollution limits, the corresponding state Watershed Implementation Plans (WIPs) and broader Clean Water Act protections continue to lay the groundwork for clean water in the region. The Coalition is interested in programs that have the potential to create cost-effective achievement of the goals set forth in the Chesapeake Bay Total Maximum Daily Load (TMDL) and Maryland’s Watershed Implementation Plan (WIP). The Coalition recognizes that the nutrient credit trading in the Chesapeake Bay watershed could be a cost effective mechanism to meet a portion of the required TMDL reductions. However, improperly designed programs increase the chance of water quality degradation, which ultimately means failure to meet water quality goals. We commend MDE for listening to many of the concerns of several of our members and other stakeholders in creating regulations to comment on rather than trying to establish a trading program simply relying on guidance. We urge MDE to include more details in the regulations and make some changes to improve the regulations in order to make a robust trading program that will not endanger water quality in the Bay or at the local level. 1. The regulations must adhere to the EPA technical memoranda on nutrient trading. The Environmental Protection Agency (EPA) has developed a series of technical memoranda that provide details on EPA’s expectations for nutrient trading programs designed to meet the Bay TMDL target allocations. Specifically, the technical memoranda elaborate on Appendix S and Section 10 of the TMDL. These are not merely guidance, but reflect the fundamentally important “expectations” of EPA, the Chesapeake Bay Program (CBP) partner responsible for ensuring accountability in the TMDL implementation. As you know, if Maryland chooses to ignore the memoranda, it runs the risk not only of forcing EPA to object to permits and reject credits or offsets for use in meeting TMDL allocations, but also of losing credibility in the eyes of other partners and the public. 2. The draft regulations must require the use of a 2:1 uncertainty ratio for all trades involving nonpoint credit generators. The pollution loads from nonpoint sources of pollution, which by definition lack discreet “point” source outfalls, are very difficult to measure. When these nonpoint sources implement Best Management Practices (BMPs) to reduce pollution loads, the reductions are equally difficult to measure. In practice, these loads and pollution reductions are never measured, but are instead estimated. Nutrient credits generated by nonpoint sources are therefore inherently uncertain. BMP efficiencies are often derived from limited research or small-scale, intensive, field-monitoring studies in which they may perform better than they would in aggregate in larger applications . . . Thus, estimates of load reduction efficiencies are subject to a high degree of uncertainty. The CBP partnership BMP effectiveness values vary across the Chesapeake Bay watershed for conditions such as implementation date, growth rate of crops, and physiographic region. These adjustments generate BMP effectiveness values that are unbiased and realistic but not necessarily conservative because they were established using realistic estimates for load reductions that do not reflect additional sources of uncertainty, especially hydrological variability and operation and maintenance over the lifetime of BMPs. The uncertainty ratio recommended in this technical memorandum is designed partially to account for those additional sources of uncertainty. This means that there is a reasonable probability that a BMP will not generate the pollution reductions that it is given credit for. In order to avoid a net increase in pollution loads, EPA expects the states to use an uncertainty ratio “of at least 2:1” for trades between nonpoint credit generators and point source credit buyers. In other words, a credit buyer hoping to offset one pound of new nitrogen load would have to purchase credits worth two pounds of nonpoint nitrogen. EPA allows for two possible exceptions to this policy. The first is where “direct and representative monitoring of a nonpoint source is performed at a level similar to that performed at traditional NPDES point source.” The second is where land conservation is made “permanent” through a conservation easement or other deed attachment. In general, however, Maryland is required to apply a 2:1 ratio to all nonpoint-point trades. The draft regulation defines uncertainty ratios, but does not include any substantive language about them. We presume that this is an error in drafting – since MDE included a definition, we presume that the Department intended to include substantive language. Maryland’s most recent guidance manual includes some language about uncertainty ratios, but misses the mark. Specifically, the manual requires a 2:1 uncertainty ratio for trades between nonpoint credit generators and “wastewater point sources,” but does not require a 2:1 ratio for trades between nonpoint credit generators and “stormwater point sources.” This is an arbitrary distinction, and it is impermissible. The characteristics of the credit purchaser are irrelevant to the policy goal that a 2:1 uncertainty ratio is intended to serve. The uncertainty ratio is there to ensure that credits do not overestimate the pollution reductions achieved by the credit generator. When direct and representative monitoring of the pollutant loadings from a nonpoint source is performed in a manner and at a frequency similar to that performed at VPDES point sources and there is consistency in the effectiveness of the operation of the nonpoint source best management practice (BMP) approaching that of a conventional point source. When nonpoint source credits are generated from land conservation that ensures permanent protection through a conservation easement or other instrument attached to the deed and when load reductions can be reliably determined. MDE should adopt the same language and apply it to all trades and offsets. Furthermore, the same logic should apply to all trades involving nonpoint credit generators, including the sale of credits to nonpoint credit purchasers. Again, the uncertainty ratio is there to ensure that credits do not overestimate the pollution reductions achieved by the credit generator. The characteristics of the credit purchaser are irrelevant. 3. Use a retirement ratio to ensure net improvement to water quality. Trades must result in a net decrease in loads. To ensure this net decrease is achieved, 10 percent of the agricultural credits sold in a trade will be “retired” and applied toward Tributary Strategies or TMDL goals. The buyer will retire the credits following the transaction, and this determination should be reflected in the buyer/seller contract. At the January 8, 2016 trading symposium, MDE stated that a percentage of credits will be retired for the sake of net water quality benefit. We agree with this policy and urge MDE to ensure that these levels are included. As noted above, the current draft omits the retirement ratio and instead includes a ‘reserve ratio.’ The reserve ratio alone is insufficient for two reasons. First, it is not a retirement ratio, and does not ensure a net reduction in pollution loads. Second, at the end of the year there is nothing preventing MDE from distributing the reserved credits to noncompliant dischargers. This means that not only is there zero net pollution benefit, but there is also an incentive to polluters to fall short of their pollution reduction targets. We have no objection to applying a reserve ratio if MDE also incorporates the appropriate retirement ratio. 4. Ensure that trading does not cause degradation of local waters or pollution hotspots. We strongly support the intent of the language in section .05.B. The TMDL and EPA’s technical memorandum on local water quality both prohibit trades that would cause or contribute to local water quality impairments, including any exceedances of water quality standards. We commend MDE for limiting trading to credits generated upstream of where the water discharge reaches impaired waters as a good practice to help ensure compliance with local water quality standards. However, section .05.B.1, as written, is too narrow and is inconsistent with section .05.B, the TMDL, and EPA’s technical memorandum. Section .05.B. prohibits trades that would cause or contribute to an impairment or to an exceedance of water quality standards. We would strongly urge MDE to consider language that would avoid creating pollution hot spots for local communities by requiring all trades be executed within a small watershed and where the credit generator is upstream of the purchaser. At a minimum, however, we would request the following. We also urge MDE to ensure that permittees, particularly MS4s, do not use trading to meet the entirety of their permit. Trading should not be allowed to offset more than 50% of a permittee’s pollution reduction requirements. This would ensure that local waters are not significantly degraded and also ensures that MS4s do not abandon all stormwater and polluted runoff reduction efforts within the boundaries of their jurisdictions. 5. Include additional details on enforcement: The regulations should ensure greater enforcement against fraud in the program and repeat offenders. Since nutrient trading creates a host of new enforcement issues, the draft regulation must add significantly more detail on enforcement. Section 11 should outline specific enforcement measures that MDE would pursue in response to credit failure, willfully fraudulent trading or verification misrepresentations, and repeat offenders. To begin with, the regulation should clearly and comprehensively state that credit purchasers are responsible for credit failure, and that a credit failure is a permit violation subject to Clean Water Act and state law enforcement. Section .08.A.1(d) states that “in the event of a default in a trade contract or the invalidation of credits, the MS4 permittee using those credits remains responsible for complying with MS4 permit requirements that would apply if the trade had not occurred.” This is a step in the right direction, but it does not go far enough and only applies to MS4 credit purchasers. The draft regulation should expand this language to state that permittees are subject to enforcement for permit violations in the cases of credit default, and apply that language to all credit purchasers. Enforcement provisions should recognize that there will likely be minor infractions, or a failure of a BMP performance, that can be corrected expeditiously. They should authorize administrative compliance orders to address these and other violations, coupled with penalties for failure to comply. In addition, we recommend that the regulations expand the enforcement sanctions for willfully fraudulent trading or verification, and for repeat offenders. A noncompliant verifier working with a willful counterfeiter of credits could jeopardize the integrity of the entire trading system and the health of the Chesapeake Bay. Greater enforcement mechanisms are necessary to reduce the temptation to falsify credit verification reports, particularly when the verifiers are third party entities. Both the MDA and MDE should have the authority to impose on any noncompliant party a ban from the nutrient trading system of up to 10 years, as well as a lifetime ban for the most serious and/or repeat offenders. The MDA should also refer cases of fraud to the State Attorney General to take appropriate action under the state's general civil and criminal fraud laws. Finally, we recommend the Department include a definition of “significant noncompliance” since this term is used in .04E. (1) to describe one basis for becoming ineligible to participate in the trading program. The draft regulation currently includes very little detail on verification, despite the fact that Maryland has adopted a comprehensive Best Management Practice verification plan. Much of the verification under this plan will be done by MDA, but the plan also assigns numerous responsibilities to MDE (e.g., stormwater BMP and wastewater treatment plant verification, review and submittal to the Chesapeake Bay Program of MDA verification data, etc.). To the extent that the BMP verification plan may overlap with the nutrient trading regulation, MDE should incorporate the overlapping policies and language. In addition, section .05.E(5) suffers from both substantive and drafting problems. First, section .05.E(5) states that “permanent credits are available in perpetuity and . . . may be verified annually.” This suggests that permanent credits may not be verified at all. Nothing is truly “permanent,” and MDE must prescribe some form of follow-up verification for any practice used to generate credits. Maryland’s BMP verification plan lays out a schedule for initial and follow-up inspections for virtually every kind of credit-generating practice. EPA’s technical memorandum on verification simply says that the Agency expects “all credit generating projects and practices to be verified on an annual basis.” MDE must ensure that the draft regulation is consistent with that plan. Section .05.E(5) goes on to exempt two types of practices from the preceding language, but because the preceding language includes three clauses, it is unclear what the practices in .05.E(5)(a) and (b) are exempted from. If the language exempts (a) and (b) from the “may be verified annually” clause, then MDE is effectively stating that these two practices – converting septic systems to wastewater treatment plant hookups and land conversions with deed restrictions – cannot be verified after initial project completion. It makes no sense for MDE to tie its hands in this way. Since .05.E(5) does not require anything beyond initial verification on project completion, there is no reason to exempt any practices, and the word “except” and parts .05.E(5)(a) and (b) should be deleted. The draft regulation presents a conflicted set of requirements for the use of credits over time. On one hand, credits are generally valid for one year and cannot be banked for future years – a good policy (section .05.E(4)). On the other hand, the draft regulation contemplates “permanent credits” (.05.E(5)), and “[p]ermittees are required to secure credits in perpetuity or the term of their permit,” (section .05.E(6)), or for up to 20 years (section .07.A.(3)(b)(ii)). The draft regulations fail to explain how a permittee could “secure” credits for 20 years (or in perpetuity) when most credits are annual and expire a year after they are created. This issue requires careful thought on MDE’s part. The Department may wish to require that long-term credit purchases be limited to long-term credit generating practices such as land conversion with deed restrictions. Alternatively, the Department will have to provide a mechanism by which permittees can “secure” credits in a way that the Department can validate and track. A simple contract between a permittee and a broker, where the broker promises to find annual credits every year for the next 20 years, is plainly insufficient. MDE must adhere to EPA’s expectations in the following ways: (1) It must revise the draft regulation to specify that “securing” credits means lining up credits from specific projects and/or practices (not from brokers), and (2) it must include how the credits were secured in the relevant permit, fact sheet, and administrative record. As written, the draft regulation would allow for “multiple facilities in a watershed” to form an association and obtain a single permit (a “bubble permit”) as co-permittees. This provision is not authorized under the Clean Water Act and has no basis for inclusion in nutrient trading regulations. Moreover, even if a way could be found todesign a “bubble permit” that is consistent with the CWA, we have serious concerns about the impact of bubble permits, which create a laundry list of potential problems for local water quality, transparency, accountability, and enforcement, and must be avoided. For example, as drafted, the term “watershed” is not defined and could allow permittees anywhere within the Chesapeake Bay watershed to combine their discharge limits. Worse, the draft regulation establishes no restrictions at all on the number of owners forming an association. Theoretically, a single “bubble permit” could be written for all nutrient dischargers in Maryland’s Chesapeake Bay watershed. Even a bubble permit involving a limited number of facilities poses significant permit-writing and enforcement questions. How will MDE ensure that there are no local water quality impacts at all locations? As a preliminary matter, how will MDE even conduct a “reasonable potential” analysis, which it must do pursuant to the Clean Water Act, to determine whether water Quality-Based Effluent Limitations are required? Will co-permittees report their discharges individually, as a group, or both? These are just a few of the questions that are not addressed in the draft regulations. MDE needs to initiate an entirely new rulemaking process and create a new set of regulations to address all of the complex issues and potentially dangerous consequences of bubble permitting. It is inappropriate to address this issue with five lines of text in an unrelated regulatory proposal that contains no reference to bubble permits in the Statement of Purpose. Section .07.B(2)(d) is unclear. Subsection (d)(i) begins with “If greater than 6,100 pounds per year total nitrogen load cap and 457 pounds per year total phosphorus load cap.” It is unclear what is (or is not) greater than these load caps. It may be baselines, but it may also be “previously assigned 2004 Point Source Tributary Strategy” goals (section .07.B(2)(d)(i)). MDE should clarify. That section goes on to describe how the baseline can be “no more than 50 percent of the amount that is above [the load caps].” This is unclear mathematically. Why would the baseline be half of the excess above the load caps? We strongly encourage MDE to clarify this language as well. Furthermore, section .07.B(4) suggests that the baseline for significant industrial dischargers will be “based on a combination of historical performance levels, the amount of loading reductions already achieved since the initial baselines established in 1985, and establishment on a case-by-case basis of additional potential loading reductions.” This language is ambiguous and appears to be a statement of purpose, but is not appropriate in the context of a regulation. MDE should settle on a baseline definition and provide a precise statement for the benefit of the regulated community and public. The baseline provisions must be rewritten to ensure full compliance with EPA’s Technical Memorandum on Establishing Offset and Trading Baselines (February 2, 2016). In particular, for any point source discharger, baseline must include compliance with any technology based requirements and with any Water Quality Based Effluent Limitations (WQBELs) established by the permit. For nonpoint source dischargers, baseline requirements must ensure compliance with any applicable load allocation “for the appropriate sector [of which the NPS is a member]…and…needed to facilitate improved environmental compliance with WQS.” The load allocated to an individual NPS within a sector should be calculated to ensure that that source is doing its fair share to contribute towards achieving compliance with any applicable WQS so as to avoid inequitable burdens being placed on members of the sector whose baselines are established at a later date. While many if not most baselines will be established by MDA under its regulations, MDE will likely be called on to establish some of these, and its regulations therefore must include appropriate provisions to enable it to do so. The Maryland Water Quality Trading Advisory Committee rightly reached a decision that wastewater treatment plants should not be allowed to sell credits representing the extra capacity of their wastewater treatment plants. Not only does it not comport with Clean Water Act principles and the fundamentally important principle of additionality embedded in the TMDL, it can also flood the market with ‘free’ credits that interfere with the creation of the viable marketplace that MDE is trying to create. Several MS4s have already declared the intent to use this allowance as a loophole to get out of financing new stormwater projects if it becomes available. In subparagraph .08A. (1)(b)(iv), the regulations allow an MS4 to purchase capacity credits if other sources of credit generation do not “reasonably” meet the demand. This provision is both ambiguous and inappropriate. The entire purpose of these regulations is to create the rules for the marketplace. Not only does this open-ended provision not precisely define what is “reasonable,” it represents a very clear and bold loophole that could sabotage the marketplace and, more importantly, all of the past and present efforts to meet our commitment to the Bay TMDL and attain local water quality standards. By making capacity credits the trade of last resort, the Department is in essence declaring that (a) capacity credits are not an appropriate or effective means of reducing pollution; (b) the purchase of these undesirable credits is preferable to stimulating demand for new and effective pollution reduction projects and practices through market signals (higher prices); and (c) that giving pollution allowances away is preferable to the enforcement of existing pollution limits set out in Clean Water Act permits. Wastewater treatment plants should only be able to generate credits if they invest in new projects or undertake other new initiatives that create additional pollution load reductions which would not otherwise occur. Credits fail this additionality test if, for example, they are not set at a baseline consistent with the nutrient load concentrations envisioned in state law (3 mg/L for nitrogen; and .3 mg/L for phosphorus) and created by wastewater treatment plant upgrade projects that have already been completed and financed with taxpayer dollars. We strongly urge MDE to create clear eligibility requirements for credit generation by wastewater treatment plants. These criteria could include, for example, the submission by the facility of an application created by the department that allows the proposed credit generator to describe what additional capital projects or operational changes the facility will undertake, an estimate of the load reduction to be achieved, and the formula that the applicant will use in this estimate and that the department will use to ultimately certify the number of credits created. The formula must ensure that credits are only certified for reductions that are based on (1) new or additional projects, investments, or actions taken; (2) reductions below the “enhanced nutrient removal” load concentration levels set by the General Assembly and codified in Title 9, Subtitle 16 of the Environment Article; and (3) load concentration levels which are, in fact, lower than historic levels for the facility. 11. Increase Transparency: Provide an opportunity for the public to comment on an application for credit approval when MDA or MDE receives a completed Certification and Registration Form. The regulation needs to include more opportunities for transparency into the nutrient trading program. The MDA regulations give some guidance to what MDE should include in the regulations. These regulations stated in Sections 07.B and C the essential requirements that must be met before a credit can be certified. Section 07.F of those regulations specifies that credits may be “certified” once those requirements are met, and Section 07.G says that following approval each credit shall be given a “unique registration number” and registered. This or similar language should also be included for other nonagricultural credit generation. There are also additional components MDE should add to this regulation. After credits are certified, include a system for tracking each credit, as required by the EPA Technical Memorandum on Certification and Verification of Offset and Trading Credits in the Chesapeake Bay Watershed. Furthermore, public notice and comment should be required when the MDA or MDE receives a completed Certification and Registration Form, along with the other documents and information required by Sections 07.A and .B. of the MDA trading generation regulations. Without the publication by the department of an announcement of the credit request and a reasonable period for comments, there is no meaningful transparency in the program. Requiring public notice and comment is the only opportunity for interested parties to review the proposed credit(s) and supporting documentation and evaluate and comment on whether: (1) the applicant has properly complied with baseline requirements, (2) the requirements that the Nutrient Management Plan and Soil Conservation and Water Quality Plan be fully implemented are demonstrated, (3) the effectiveness and likely duration of the credits have been properly calculated, (4) whether calculations requiring application of the Maryland Nutrient Trading tool have been properly performed and documented, and (5) the other information required by Section 07.A and B has been provided by the applicant. In addition, MDA and MDE should both receive a copy of the application no later than the date of the public announcement. MDE has an important interest in any measure which could affect achievement of TMDL goals and water quality standards. In most, if not all cases, any credit purchased and used by a point source discharger will be incorporated into an NPDES permit, which is issued by MDE. In cases where a credit application is submitted to MDA, MDE should have an opportunity at this time to review the credit application and provide comments to MDA. In the event MDE believes there is anything unsatisfactory in the credit, the correction should be addressed before the credit has been approved, registered, purchased, and included with a permit application to MDE. The MDA regulations in Section 08.D appear to recognize the important role played by MDE because they require that MDE be provided with a copy of the verifier’s report generated after an annual verification inspection. However, MDE regulations should also require the original application be shared with MDE as well to assist in verification. C. Promptly after a determination by MDE or MDA that an application for approval and registration of one or more credits includes all of the documentsspecified in this Section 07, and Sections 08, 09 and 10, as applicable,, the Department shall post on its website an announcement ofthe application and identifying a location where the application and related documents can be inspected and copied, and allowing a time for public comments on the application of not less than 30 days following the date of publication of the announcement. In addition, not later than the date of publication, MDE or MDA, as appropriate, shall provide the other with a copy of the application and supporting information. Finally, the Department should get copies of disputed information reports. Section 09.E of the MDA regulations allows the owner or operator of a facility to “dispute information in” the verifier’s report by filing a statement of written concerns with the MDA within 30 days of his or her receipt of the report. MDE should require that a copy of the written concerns be provided to MDE at the same time as MDA. MDE will have received the verifier’s report, and should be advised if there is a challenge to it by the owner/operator. We appreciate the opportunity to submit these comments. We would be pleased to discuss any aspect of them and answer any questions. Please contact Chante Coleman, director of the Choose Clean Water Coalition, with any questions, comments, or concerns. U.S. EPA, Trading and Offset Technical Memoranda for the Chesapeake Bay Watershed, https://www.epa.gov/chesapeake-bay-tmdl/trading-and-offset-technical-memoranda-chesapeake-bay-watershed. U.S. EPA, Accounting for Uncertainty in Offset and Trading Programs – EPA Technical Memorandum, 4 (Feb. 12, 2014). National Research Council (NRC), Achieving Nutrient and Sediment Reduction Goals in the Chesapeake Bay 73 (2011). U.S. EPA, Accounting for Uncertainty in Offset and Trading Programs – EPA Technical Memorandum, 8 (Feb. 12, 2014). MDA, Producing and Selling Credits in Maryland’s Nutrient Trading Market, 9 (Mar. 14, 2011). U.S. EPA, Accounting for Uncertainty in Offset and Trading Programs – EPA Technical memorandum, 8 (Feb. 12, 2014) (emphasis added). MDE and MDA, Maryland Trading and Offset Policy and Guidance Manual, Chesapeake Bay Watershed (Apr. 17, 2017). 9 Va. Admin. Code 25-820-70, Part II.B.1.b.(1). MDA, Producing and Selling Credits in Maryland’s Nutrient Trading Market, 5 (Mar. 14, 2011). U.S. EPA, Chesapeake Bay Total Maximum Daily Load for Nitrogen, Phosphorus and Sediment, S-4 (Dec. 29, 2010); U.S. EPA, Local Water Quality Protection when Using Credits for NPDES Permit Issuance and Compliance, EPA Technical Memorandum, (March 17, 2014). Maryland’s DRAFT Best Management Practice BMP Verification Protocol (Nov. 2015), http://www.chesapeakebay.net/documents/MD_BMP_Verification_Protocols_Final.pdf. U.S. EPA, Certification and Verification of Offsets and Trading Credits in the Chesapeake Bay Watershed, Technical Memorandum, 7 (July 21, 2015). U.S. EPA, Permanence of Credits Used for NPDES Permit Issuance and Compliance, Technical Memorandum, 5 (Aug. 19, 2014). See EPA , Technical Memorandum, Establishing Offset and Trading Baselines p. 4 (February 2, 2016). See, e.g., U.S. EPA, Components of Credit Calculation, Technical Memorandum, 5 (May 14, 2014). U.S. EPA, “Certification and Verification of Offset and Trading Credits in the Chesapeake Bay Watershed”, p. 9 (July 21, 2015). The undersigned members of the Choose Clean Water Coalition strongly support the development of Local Area Targets as an integral part of the Phase 3 Watershed Implementation Plans (WIPs). Restoration efforts needed to achieve the load reductions outlined in the Chesapeake Bay Total Maximum Daily Load (TMDL) require planning at many different scales and must incorporate sectors with varying levels of regulatory requirements. States have already made substantial efforts to outline state-level reductions in nutrient and sediment in their Watershed Implementation Plans (WIPs). These state-level plans have been a critical step towards achieving these goals. In some instances, there has also been a substantial effort to document plans at the local level. However, there is a tremendous amount of planning work that still needs to occur at the local level, particularly related to agriculture and non-MS4 stormwater. We strongly believe there is a need for, and value in, translating these restoration goals down to the local level using local area targets. Most of our members operate at the local level and having a clear target by which to measure progress is critical for garnering public support and resources and prioritizing efforts. Maryland uniquely issued local targets at the county scale during the Phase 2 WIP process. These local-scale goals provided counties and towns with a clear picture of the jurisdiction’s impact on the Bay system and the level of effort that would be sufficient to meet regional cleanup goals. Local targets were instrumental in the development of county Phase 2 WIP plans, which brought stakeholders together, assessed technical assistance needs at the local level, and often identified hidden opportunities to reduce pollution at low cost. Since then, a number of towns and counties have leveraged this planning work to develop policies and funding commitments pursuant to local targets. Talbot County has embarked on a targeted roadside ditch enhancement program and invested several hundred thousand dollars in the effort, specifically to help meet the county’s local target. Elsewhere, Queen Anne’s County and Wicomico County have each set aside substantial capital funding dedicated to local WIP implementation. The City of Salisbury and the towns of Oxford and Berlin have adopted stormwater utilities to fund, in part, Best Management Practices for water quality. A number of other jurisdictions are working to develop detailed watershed management plans that will include project lists prioritized to help meet local targets. In each of these cases, local targets have given county staff and elected officials the context they need to make policy and program decisions that support regional cleanup efforts. Loan Fund, and Chesapeake Bay Implementation Grants. Local Area Targets provide a pathway to describe how these efforts are part of a broader, statewide need and the targets help characterize progress. This capacity will provide an opportunity for local government and local partners to further leverage financial assistance through grant programs and generate other forms of local and regional support. While these efforts may not be abundantly common, they are already occurring to some extent without Local Area Targets. For instance, in Virginia, several localities (Town of Kilmarnock, Goochland County, Prince George County) have been awarded grants through the Stormwater Local Assistance Fund to reduce nutrient loads. Local Area Targets will help promote voluntary restoration work in unregulated localities and unregulated portions of regulated localities which is a critical remaining obstacle to achieving the necessary pollution reductions throughout the Chesapeake Bay watershed. We recommend that the Local Area Targets Task Force conclude that Phase 3 Watershed Implementation Plans should require Local Area Targets across the entire Chesapeake Bay Watershed. We also recommend that these targets should be directly tied to numeric load reductions consistent with the Bay TMDL. We appreciate the opportunity to provide these comments and ask that you please share them with the entire Local Area Targets Task Force. As stakeholders with a keen interest and role in implementing the WIPs, we would welcome the opportunity to be more fully engaged in the discussion about how to most effectively develop these targets so they are useful planning tools.